Evidence suggests bear spray stopped a grizzly bear attack after it mortally wounded hunting guide Mark Uptain Sept. 14, 2018, in the Teton Wilderness, a Wyoming Game and Fish Department investigation concludes. 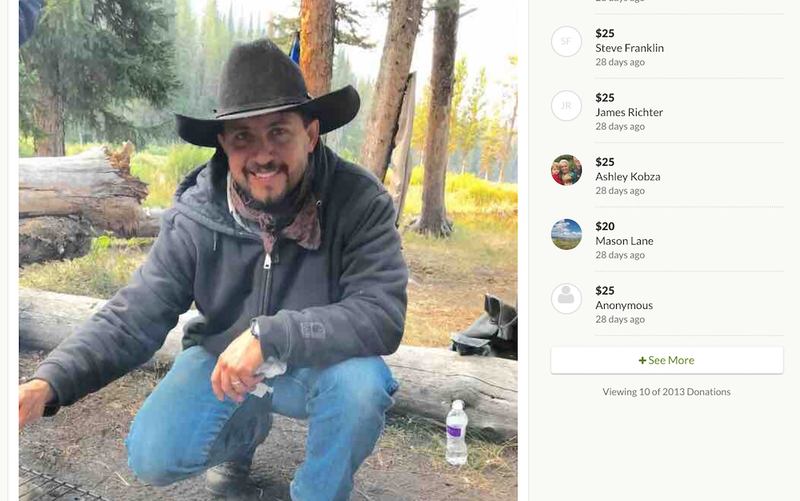 The 34-page report released Friday says evidence suggests “the desire of the bears to feed on the elk carcass” spurred them to charge full speed toward the site where Uptain and client Corey Chubon were field dressing the kill. 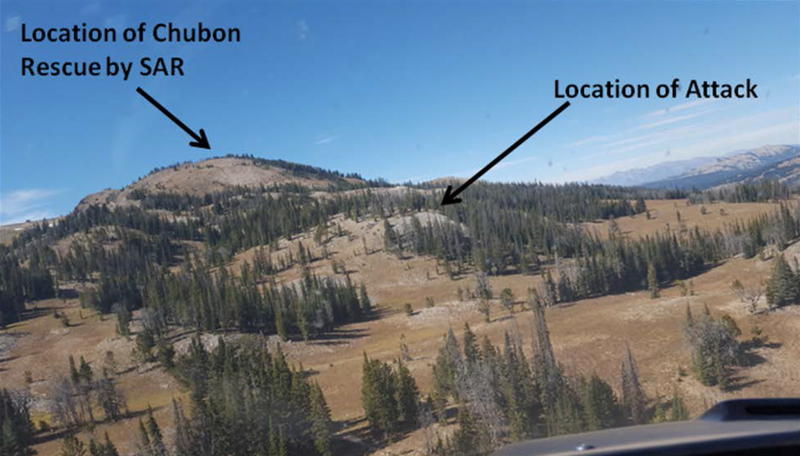 The report, released following a records request by WyoFile, documents a Game and Fish probe of the saga in which Chubon, had “made a poor shot” on an elk with a crossbow the evening before the fatal bear encounter. It reveals new details in the drama and clarifies unsettled aspects, including how quickly Uptain died. The two were attacked when they returned to the Bridger-Teton National Forest the next day to find the dead elk. The report and attached documents paint a graphic and terrifying scene in which Uptain screamed as the bears savaged him with teeth and claws causing about 38 puncture wounds and 14 lacerations, among other gruesome injuries. The report “does not include speculation about details not supported by evidence or the investigation,” the Game and Fish Department’s seven investigative team members wrote. Agency employees killed the two bears — a mother and male yearling — “for public safety” after recovering Uptain’s body. They linked the animals to the fatal mauling through lab tests. Uptain, who had a can of bear spray on his left hip, “did not deploy the spray at the time of the initial attack,” the report said. He sprayed the mother bear when it attacked him a second time. An investigator told WyoFile in November he believed the spray “could have worked perfectly.” The report is now more certain. The guide somehow went 50 yards from where he was attacked, fell, “dropped the bear spray and rolled to the base of a tree where he died,” the report reads. Uptain, an employee of Martin Outfitters based in Moran, left a wife Sarah and five children. A gofundme campaign to support the family raised $210,000 from 2,013 donors in four months, according to the website. Uptain saved Chubon’s life, the client told a television station in Florida, his home state. Uptain’s brother-in-law also heralded the guide. The site of the encounter lies about six air miles from the Turpin Meadows trailhead where the hunter and guide began their horseback excursions on two successive days, according to the investigation. The documents gave the following account. Chubon wounded the elk the evening of Sept. 13. But he and Uptain could not find the animal and so rode horses back to the Turpin Meadow trailhead. The next morning, they rode to the top of Terrace Mountain, a 15-square mile landmark comprised of open grassy slopes, talus fields, rugged cliffs and dense pockets of spruce-fir evergreen trees. “Grizzly bears inhabit the area,” the report says. At about 4 p.m., two hours after finding the elk, the two had almost finished field dressing it. Two bears suddenly appeared from downhill “running at full speed directly toward them.” The bears came into the direction of the prevailing wind. “Mr. Uptain began waving his arms and yelling at the bears moments before being attacked,” the report reads. 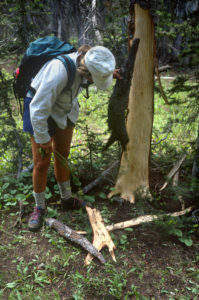 In a dizzying confrontation, the mother bear attacked Uptain at the elk carcass. Chubon dashed to the gear pile and grabbed the guide’s 10-mm Glock semi-automatic pistol. The mother bear then turned from the guide and charged Chubon. He told investigators he could not remember if he tried to pull the trigger. Chubon sidestepped the charge but the bear grabbed his right boot and pulled him to the ground. “…[H]e attempted to throw the handgun to Uptain who was now again yelling at the bear, but the handgun ‘landed short,’” the report reads. Chubon “inadvertently ejected the loaded magazine while trying to disengage the safety,” the report says. The bear turned back to attack guide Uptain again ”at which time Mr. Chubon stated he ran as fast as he could,” the report states. Chubon never accessed or used his bear spray during the attack. Chubon saw Uptain “on his feet fighting with the bear,” as he fled, the report says. “Chubon could hear Uptain scream as the bear tore into Uptain,” the documents say. The client reached the horses, about 300 to 400 yards from the carcass, mounted, rode to the top of the mountain and called 911 with a cell phone. 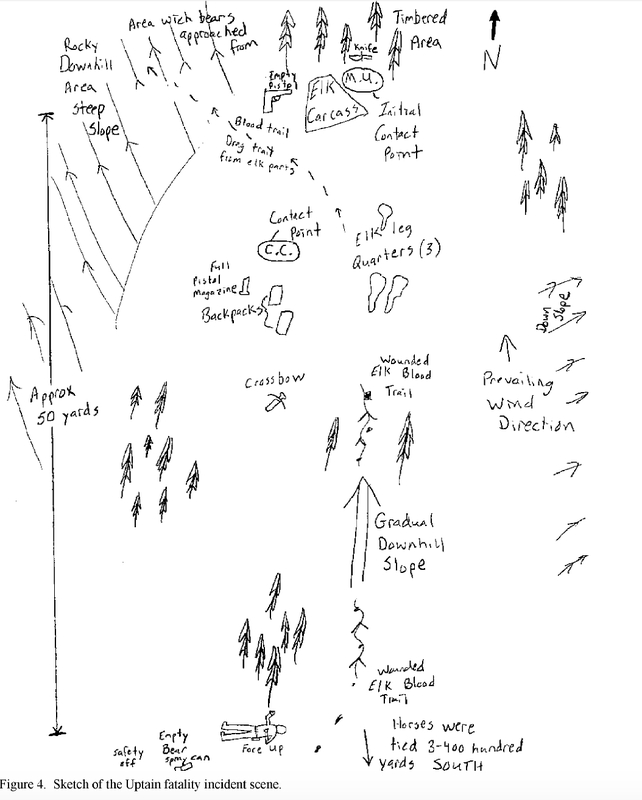 A diagram of the scene shows the Glock lying near the elk carcass where Uptain was attacked. The fully loaded magazine was on the ground near the backpacks where the grizzly attacked Chubon. Investigators found the Glock with the slide forward, without a bullet in the chamber. “The gun was not fired as a defense against the attacking grizzly bears,” the report reads. Uptain finally discharged his bear spray and somehow walked 50 yards to where he died. The investigation resolves earlier differences between the Teton County coroner and Game and Fish regarding whether Uptain could walk after being mauled. Coroner Brent Blue told WyoFile in November he did not see Uptain as “having any ability to move” after one of the bears pierced his brain with an incisor. But Game and Fish believed then that the wounded guide staggered 50 yards before he expired. In the report released Friday, Game and Fish quotes Coroner Blue’s “verbal description” of Uptain’s death as “rapid but not instant.” The wildlife agency also quoted a report by Blue that “Uptain died very rapidly after the initial grizzly bear attack.” Game and Fish did not attach the coroner’s report to its own investigation. The Game and Fish report noted “vertical blood streaks” on parts of Uptain’s body and clothing, indicating that “he traveled upright at some point while bleeding. “This evidence coupled with the lack of drag marks, signs of a struggle, or bear tracks at his body indicates that Uptain walked from the initial point of attack under his own power before he died,” the report says. The bears did not disturb Uptain where he lay dead, the report says. In addition to severe wounds to his head and thighs, the report says Uptain also suffered defensive wounds to his hands, wrists and arms. Chubon had a puncture wound to his ankle and abrasions and cuts. “The gun passed all function tests,” he wrote. “I did NOT test fire the gun.” The magazine was full with 15 rounds of “FC 10MM Auto,” flat-nosed, full-metal-jacketed rounds. The two bears were healthy, the Game and Fish report said. “Both bears appeared to be in good physical condition with normal fat deposits and no observed physical abnormalities,” the report reads. Also, they appear to have never been captured for research or because of conflicts with humans. “Neither of the grizzly bears had any ear marks, tattoos, radio-telemetry transmitters, or personal-identification implants to indicate they had ever been previously handled by the WGFD or any other agency,” the report reads. Game and Fish discounted the possibility that the bears saw the men as food. “This incident has no evidence to suggest that predation was the motivation for this attack,” the report says. Game and Fish uses four categories to describe grizzly attacks on people — predation and three types of “defensive-aggressive attacks.” The latter are made in response to a perceived threat. Defensive-aggressive attacks can occur when bears see humans as a threat to their food source, a threat to their offspring or a threat to their personal space. Bears also can make defensive-aggressive attacks when they experience a combination of those three factors, the report says. “None of the three typical defensive-aggressive situations apply to this incident,” the report says. The bears approached the men “and not vice-versa,” the report states. “…[T]herefore, the typical behavior of an adult female defending its offspring or itself by having their personal space invaded by a threat does not apply in this situation,” the report states. “The evidence suggests that the desire of the bears to feed on the elk carcass was the motivating factor in the incident,” the report states. “The grizzly bears likely attacked the two men in an attempt to displace them from the elk carcass…. The aggressive nature of the attack was unprovoked by the two men and cannot be characterized as defensive,” the report says. A diagram indicates that the bears dragged a quarter of the elk from the scene. I know very little first hand but I’ve read the accounts of every single documented fatal bear attack (both grizzly and black bear) since the late 1800’s. The one thing that is predictable is you can’t predict what a bear is going to do. It seems here lately we’re seeing a resurgance of fatal predator human encounters. Whether that can be attributed to increased populations of predators or predators losing their fear of man because of the hunting seasons being canceled by beurocrats not understanding that game management should be left to game managers. I think this report of this incident was fairly accurate. What could have prevented it? I’m not going to throw anyone under the bus here. I feel the guides actions were valiant even though it cost him his life. It sounds like the hunter panicked as most of us would have. The only thing I see missing is a lack of carrying out safety precautions. That’s easy for me to sit here and play armchair quarterback in the heat of my living room. Saying that, I set here with a Sig 45 on my hip, a 12 gauge pump 30’ away with the first 3 shells buckshot followed by 3 dragons breath. I have an AR 15 with 4 30 round mags ready to go should a home invasion or wild animal should set it sights on me or my family. If I was a guide I would have had the pistol he had with 3-4 magazines on my side with one down the pipe. Without a doubt I would encourage all guides to carry a semi or pump 12 gauge with buckshot to follow up wounded game. A safety inservice should be given to every hunter in camp on how to proceed should an animal attack, get lost, hurt… I can vivid remember how helpless I felt still 7 miles from camp when darkness fell. Me all alone and the last tracks I saw in the snow were from a good sized lion. I made it back to camp several hours later without incident. I think I read it correctly and I doubt I would have acted in the correct manner, but once the bear was attacking the desire to grab the Glock and use it was the “poor” idea. Using the bear spray on the combatants may have driven the bear off while saving Uptain’s life. I think that was the point of the bear spray headline. Very sad, indeed. Another reason I like big revolvers. There isn’t much doubt how to operate them. And I definitely wouldn’t want to spend more time than necessary dressing that game. It is easy to judge this scenario after the fact, hindsight is 20/20. The responsibility lies w/ the guide to breakdown/field dress the elk. Depending on terrain. it can take 2 guys to breakdown the carcass. An outfitted hunt typically has one guide for two hunters, so having two guides and one hunter is highly unlikely. One of the main flaws I see is an unloaded pistol. The fact that the Glock did not have a round in the chamber prevented the hunter from firing a shot due to his unfamiliarity w/ a semi-auto and the necessity to rack the slide. Glock’s have a trigger safety, and are very intuitive to discharge (grip the pistol and pull the trigger-like a double action revolver). Many law enforcement agencies utilize Glock pistols as duty pistols, and their officers carry them in Condition One, mag inserted, round in the chamber, and safety on. In a high stress situation, the officer draws his pistol, aims at target, and pulls the trigger if necessary. This happens very quickly and is a fluid motion. The guide should have had the gun in condition one, it MIGHT have saved his life. It’s unfortunate the hunter was not proficient w/a semi-auto pistol like the Glock, or in utilizing/operating bear spray. Also, 2 hours to field dress an elk is not uncommon, especially when harvesting the neck and rib meat. Hunters/clients can pick their outfitter/guides, however, guides can not. RIP Mark Uptain. Given that a grizzly killed hunting guide Mark Uptain, the headline stating “Bear Spray Repelled Killer Grizzly” is odd. It’s a tad difficult to pretend bear spray “worked” given the end result. Wouldn’t it be more accurate to say, “Bear Spray Failed to Prevent Hunting Guide’s Death–Twice.” Despite carrying bear spray in a “quickly accessible” hip-holster, guide Mark Uptain did not have time to deploy his bear spray and suffered injuries during the first attack by a charging grizzly bear. Despite hitting the grizzly with bear spray the 2nd time it attacked, the bear killed Uptain. Turning those bear spray failures into a headline stating “Bear Spray Repelled Killer Grizzly” is a feat worthy of Trump defender Sarah Huckabee. We live and hunt in the Moran area, no hunter or guide should ever hunt in this area which is heavily used by Grizzly Bears without proper protection ( bear spray and a large caliber pistol) with good knowledge of how to deploy both accurately and quickly. Also while field dressing one person does the work while the other scans the area for bears. NEVER leave your personal protection (spray and hand gun) with pack or other supplies, always keep them handy for immediate use if necessary. What a sad and horrible situation. Game and Fish did the right thing by eliminating those 2 bears. First off it is horrible that this man lost his life and left a family behind. That said, these are top predators in this area. Why is it so hard to believe that they will fight for an easy meal. (Watch an African Nat geo video about predators). Its unfortunate that the client in this situation does not know how to use a weapon or the bear spary to aid his guide. And that he would totally leave another person on this situation. ( I’ll call 911😔) If this guide would have been up there with one of his colleges or buddies. I believe this would not have happened. Sad to see that we go onto a bear’s house and then later execute them for acting like bears…. Thanks for excellent reporting on this tragic event, Angus. We live near the wilderness, north of Cora; have seen several Grizzlies. Luckily, we are not dead or wounded from those sightings on foot & horseback. When there was a carcass involved, I was glad to be on my horse. Not to be taken for granted…the wilderness. So sorry for the family, the children who will always miss their Dad. Sorry for the client; guilty feelings that will haunt him forever. Sorry mam, Pull your head out! I hunt in Grizzly country all the time it has nothing to do with management of the bears! This was a tragic accident and the blame should not be pointed at anyone! This has nothing to do with the Wyoming game and fish or the feds! Maybe we need to start eliminating a few grizzly bears from the population! NEVER run from a grizzly bear. If the client did not know how to use the Glok, he should have known how to use the pepper spray he was carrying (or had been carrying). The stuff works and you don’t have to be a crack shot with it. Not cool to take off and leave your partner behind. It is always best to get any game out the same day it is killed. Bears have good noses. That is not always possible. Thanks WyoFile and Angus for your investigative reporting. It is unparalleled. And necessary to remaining FULLY informed. Better hunting regulations? What do you know about Wyoming hunting regulations. Lady from NYC who probably has never held a Wyoming hunting license, let alone stepped a foot in the backcountry, criticizing another State and how it operates. How about focusing on New York’s crime rate, suicide rate, homeless epidemic, and education. You know, the I Love New York State. It’s comments like yours that create false sense on important issues and skews peoples perspective who are not familiar with the facts. And yes, the Wyoming Game and Fish can certainly manage wildlife in our State better than the Federal Government. What most people don’t know is that bowhunters, like trappers, are not required to take a hunter education course which includes firearm safety. Why are any of the public exempt from mandatory education? Thanks for the updated report WyoFile! Two hours seems like a long time to dress and quarter an elk. Especially in grizzly country. I think if I were to hunt in griz country and then field dressing the kill, I think the guide, (who has the griz knowledge ) should stand guard, at the ready for defense if needed. I have absolutely no knowledge of griz country and if I ever go I will remember this sad story. I solo hunt and I fully dress elk carcasses and take all trim possible. An afternoon to dress and Cape a bull is common and sometimes 4 days to pack out depending on how far from the trailhead. This past year it was 5 days. Over 6 miles in. There is no proof a 10mm would have put down an adult grizzly before it could kill you. I carry a 357 but a 44 or larger would be better. A 10mm has about the same power as a .357. An unfortunately sad learning experience for those who spend time in Grizzly country. Is the report available to read in full? This is one I’d love to study. I agree. There’s a lot that could be learned from this report. I remember reading Outdoor Life a lot when I was younger and this story falls under the “This Happened to Me” section two fold. I think after reading all those stories back then it has made me a little more aware, all be it one could say not enough, i wonder if this account could actually and unfortunately fall under the “It Won’t Happen To Me” mind set. I don’t hunt in grizzly country mainly for this reason although I did hunt bison once and I honestly can say I don’t think I was bear aware as I should have been. My condolences to all involved and I hope valuable lessons can be learned here. This has nothing to do with regulations at the state nor federal level, i.e., unless one wants to require 2 outfitters. This has to do with not being prepared. Too much focus on quartering and removing – neither were prepared for worst-case scenario. The bears were apparently not seen in time (10-15 yards at full charge?) for either the bear spray or the Glock. In wooded areas, with scent of blood present, there should have been a post, who had all options of defense ready at hand and ready to be used. Sadly, loss of life was the result. I say this not to blame. I myself have been negligent in this arena. I point it out to help us who are still alive and hunting to prevent a repeat. Agreed. During the 2-3 hours they were field dressing the elk, the scent of elk blood and guts was being broadcast downwind to any and all grizzlies in hyperphagia. The hunter should have been posted downwind from the guide field dressing the elk. Instead, he was upwind. No bear spray. No firearm. A recipe for disaster. The scent had been broadcast since the day before and the assumption that the grizzlies had not been on scene before the hunters is a big one. Lots of missing variables, but father was a Wyoming game warden form many years and he always spoke of being cautious around a gut pile. 1. Any elk left overnight will be spoiled by the next day. 2. The smell of a day-old spoiled carcass is enough in and of itself to attract bears. 3. Can you imagine how strong the rotting carcass would be once it is opened up…..gutless method or not. 4. Grizzlies are known to hunt for wounded elk or gut piles and are conditioned to this behavior in Montana and Wyoming. 5. Outfitter should have had the hunter and guide trained in the use of bear spray in grizzly country. 6. This is a sad situation and second guessing will not change anything…..but a 12 gauge pump shotgun loaded with alternating buck shot and slugs is better than any pistol on the planet. 7. When hunting in grizzly country hunters and guides have to be prepared. 8. The elk was spoiled……..punch the hunters tag, cut off the rack and get ot of the area asap. 9. Sad deal……sorry for both hunter and dude hunter. I wasn’t there, and neither were you. The guide was. And with his experience- both in handling carcasses and in bear country- he must have deemed the meat to be fine or he surely would not have put himself or his client in this position. Thank you, once again, Angus and WyoFile for bringing out the complete story of this tragic incident. The print and other electronic media painted a very different story early on. You guys do it right for all of us living in Wyoming. Thanks. I really don’t understand why WYGF is still insisting that the bear’s behavior falls outside “typical” aggressive-defensive situations. In fact, all three have relevance here. Quit trying to make it sound like the bear’s behavior was aberrant. Bears commandeer kills regularly, which means that the mere presence of the men was provocation. That, coupled with the time of year, the heavy blood trail, and the presence of the cub were the only provocation that bear needed. It appears that this report is trying to make the details fit the preconceptions, rather than admitting the limitations of your models. Well said and I believe 100% accurate. What it really proves is better Hunting regulations are needed in Wyoming. You know the state that believes they can manage wildlife better than the Federal Government. Not that the Fed’s are overwhelmingly great. If you can’t properly manage safety with your hunters you are NOT what you cracked up to be. Please keep your opinion about the safety of hunters and your opinion on how much regulation people need in New York. It is very clear that people who don’t actually have first hand knowledge of this country have no idea what it is like to be in the forest with wild animals. No amount of federal regulation can keep you safe if you choose to go there. 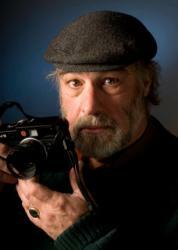 By all accounts Mark Uptain was very skilled, smart, and was doing what he loved. People who live in my area are extremely sad and distressed that he was killed by a grizzly, which we believe to be a tragic accident. We mourn him and care deeply for his family and friends. With that, we will go about doing what we can to keep ourselves and love ones safe. We take our chances because we choose to. Please be kind with your speculations. You were not there. You have no idea what it is like to encounter something like this. Leave it to someone from New York, New York to make such an ignorant and uninformed statement. You may want to check into which state has the healthiest grizzly bear populations. Also hunting is one of the safest pastimes available. Please take a few minutes to learn a little bit about hunting and grizzly bears. You will see that hunters are responsible for their recovery and hunter safety is the main reason these reports are shared to the public. The state tried to manage these Grizzlies which would have gave them a fear of humans again. Unfortunately those rights were mandated back to the feds who would rather do nothing as the population explodes. This event had nothing to do with wildlife management until decisions were made about how to deal with (or not) the bears. Living, recreating and doing business in bear country requires being prepared for extremes, especially during the pre-hibernation period. It is a fact that the grizzly population has been increasing, and interactions with humans have been as well. It’s easy to criticize from NY, NY, but wild land and wildlife management is probably not what you envision. You can’t write regulations to prevent natural animal behavior. Hopefully, from this horrific incident…….all “Outfitters” will proactively introduce common sense instruction to their guides and to their clients. Wondering………if a “second” guide had been present…….as a “lookout”…….perhaps this tragic, devastating, life altering incident could have been prevented. Using the term “common sense”…….as there were “only” two men present…..both…..of them were focused on their mission of quartering the elk…….which opens “them” up……to a surprise attack in what is known to be “Grizzly Country”. A good man lost his life and 2 grizzlies are lost as well. “Life” lessons to be learned here. They were in the process of breaking down the elk in order to haul out the quarters and other meat when they were attacked. It’s basically laid out in the article and report. Why did they not haul the meat out just after they killed the elk? Did you read this at all??? They could not find the elk the same day they shot it. they didn’t find it till the next day at which point they begun cleaning it to haul it out.